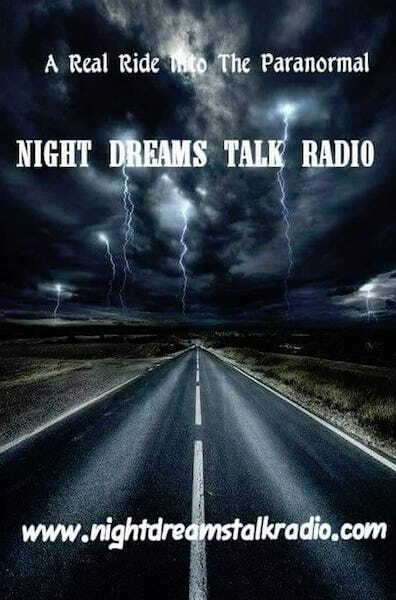 Tour guide Allan Pacheco is a renown paranormal investigator and historian, he is a regular on many national radio broadcasts (PARANORMAL). 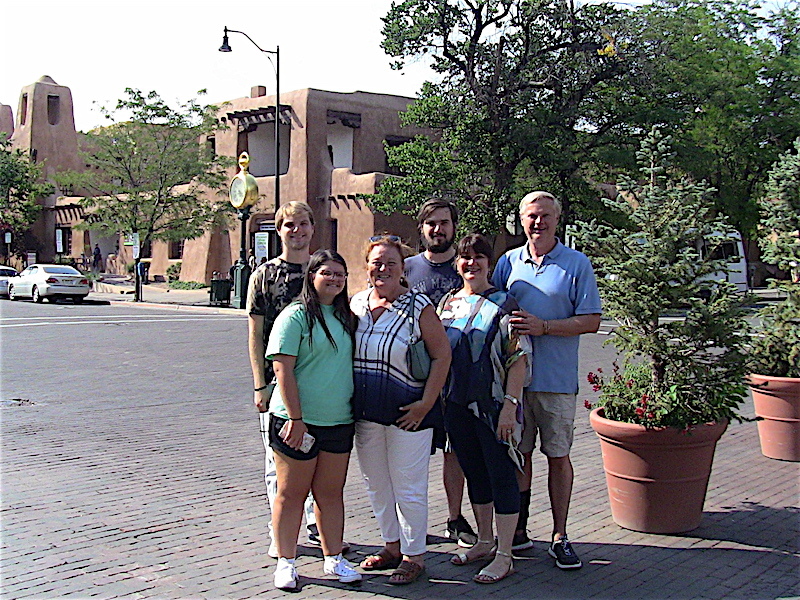 Allan was born in Santa Fe, this native who's family was here before the Pilgrims landed at Plymouth Rock, gives you the low down, on Santa Fe's legends, lore and facts. 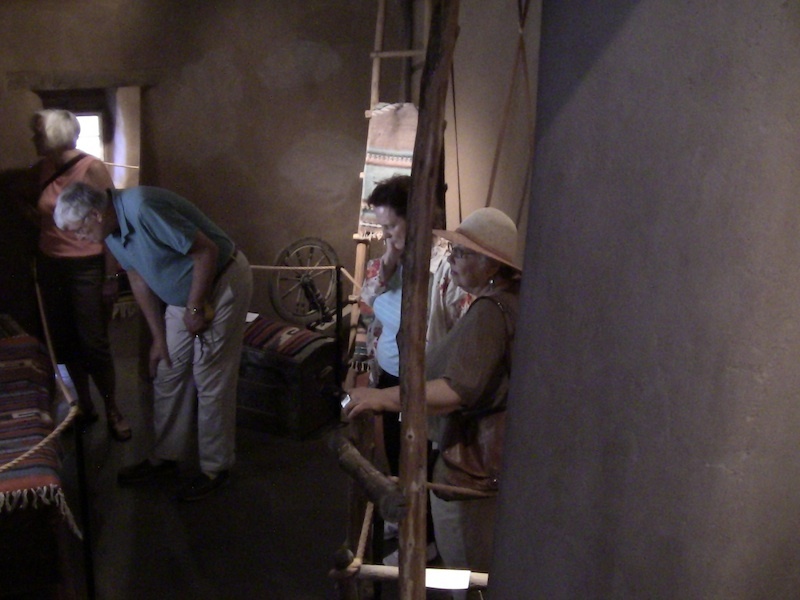 Ghosts of Santa Fe Tour is a tour you will remember, Allan's tours have been rated as the best in Santa Fe. Bring your camera, you never can tell when you are on a -- Ghosts of Santa Tour. Allan's tours are done day and night 505-986-5002 or 505-231-1336. 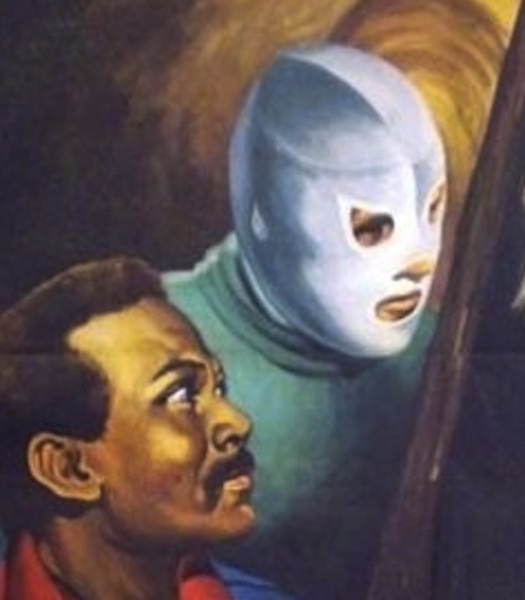 Below: a review of Al Pacheco's "Ghosts of Santa Fe Tour". Wanted to thank you for the best tour ever, I loved it. Just wanted to express my gratitude to you for an amazing experience! 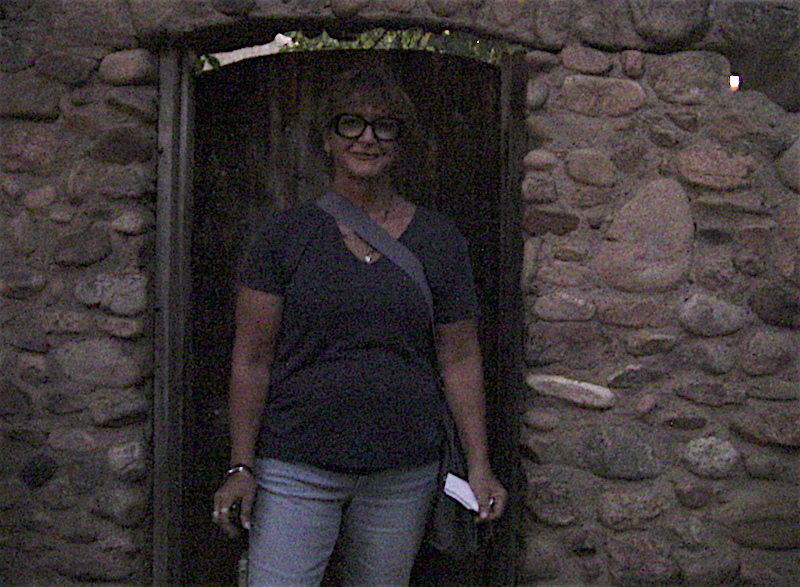 On safari --- ghost tour (DUSK) ---Leslie on SPOOK LANE -- --- This is a historical and haunted place! 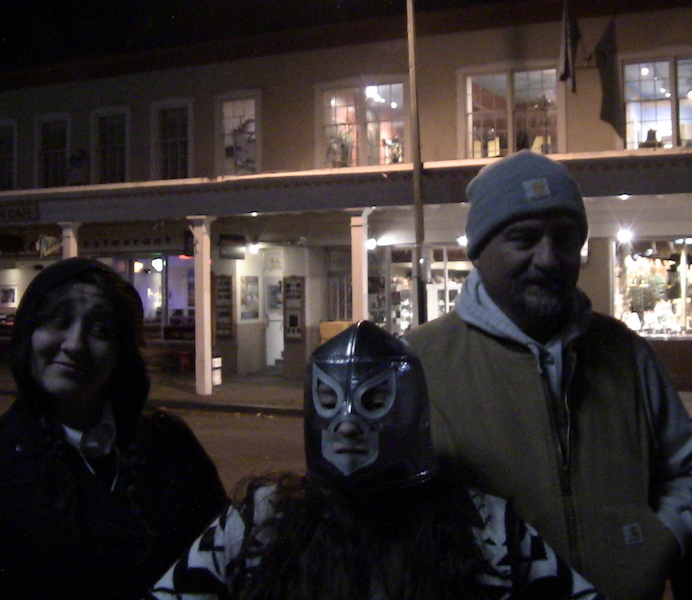 Above -haunted Santa Fe streets… ON GHOST OF SANTA FE TOUR-- YOU CAN WEAR YOUR LUCHADOR MASK -- OR COME IN CoStUmE! More importantly, if you have a ghostometer or gadgets, bring them! The HAUNTED OLDEST HOUSE ---- ABOVE: CONTEMPORARY TOUR LED BY ALLAN & BELOW AN ACCOUNT OF A HAPPENING INSIDE THE OLDEST HOUSE. My wife, Christina, and I went to the Oldest House for the first time on Friday, April 14th, 2017. At the time, we were the only people in the house. While I was exploring the front room of the Oldest House, Christina went ahead into the back room alone. She had not been in the room for more than a minute, standing by the long dining table, when she heard a loud, heavy and gutteral sigh literally inches from her right ear. This was followed immediately by cold chills. She hurredly called to me from the other room. 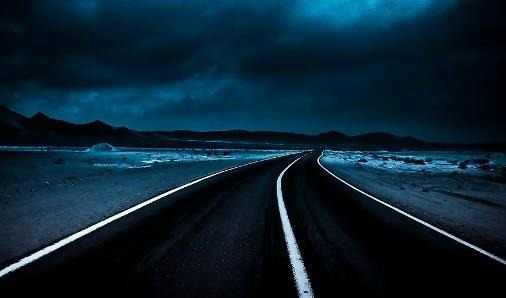 The moment I stepped into the back room, I felt chills emanating from the soles of my feet to the top of my head. We have been in plenty of haunted locations throughout our travels, so we instantly knew what this meant. Nevertheless, we looked around for air conditioning vents, other visitors or anything else that might naturally explain what she heard. 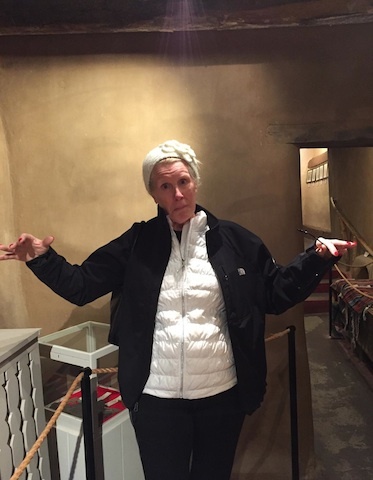 The only thing we found was a hole in the ceiling, which is where I thought the spirits lived (it was only the next day that you told us that no one has been in the upper story of the Oldest House in decades). Christina wanted me to take a picture of the room, in hopes of catching something on film. We had done this once before with great success in the Tower of London. As I turned on my camera, and Christina was exiting the room, I noticed a tall, thin white wisp pass in front of me, moving from the table to the left display case. I took a picture (see attachment), but I'm not sure if anything really came out on the photograph. 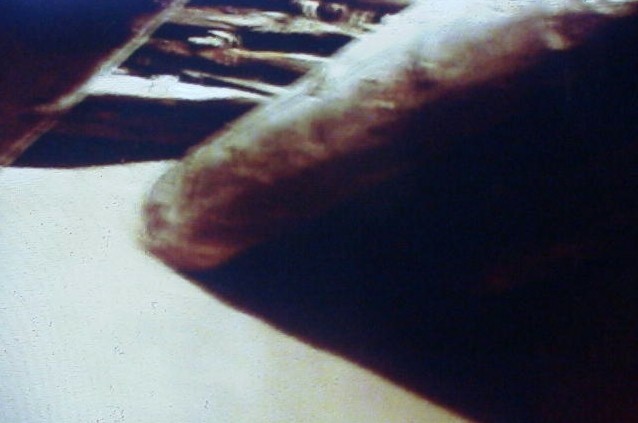 There does appear to be a long black shadow in a vaguely humanoid shape between the table and display case. We took some more pictures of the room both that Friday and the next day on your tour, and nothing similar has reoccured in those. I hope one day you can find an explanation for these events in the house, and, if you get permission to go into the upper story, I'd love to be there! 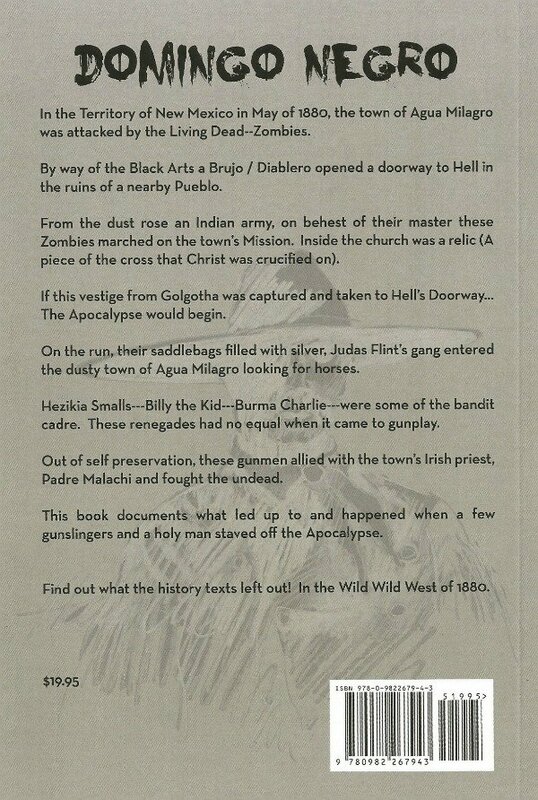 Thank you again for the wonderful stories of Santa Fe. The account above happened the day before Michael and his group went with ALLAN on tour into the OLDEST HOUSE. 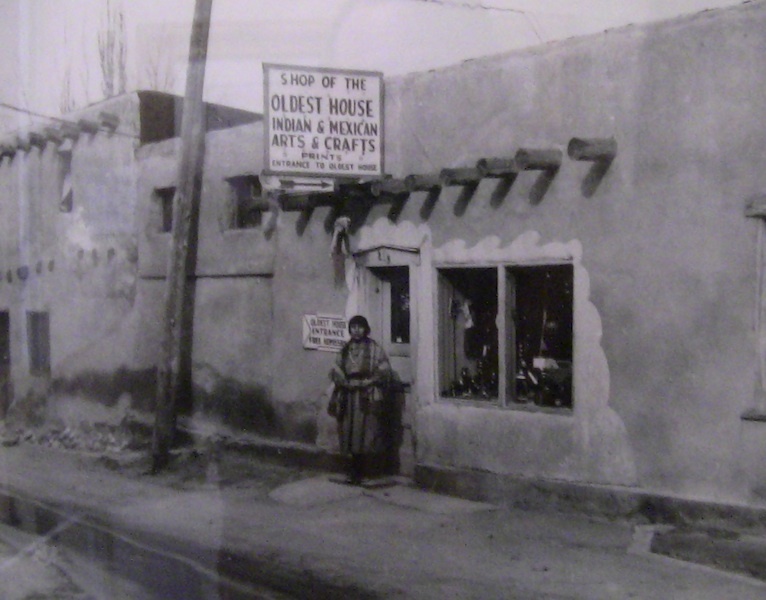 ON the GHOSTS OF SANTA FE TOUR --- Allan explained the myth, lore and facts of the haunted OLDEST HOUSE. As in the many murders that happened inside or around the building, the witches that used to live there, and what was discovered during investigations at this house. 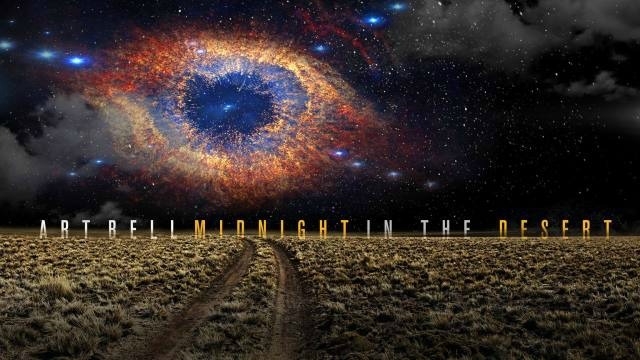 In other words, what Michael and wife felt or saw was not outlandish, this property is the domain of a number of energies that date back to CONQUISTADOR DAYS, WILD WEST DAYS and MODERN TIMES. ABOVE & BELOW = OLDEST HOUSE CEILING = PHOTOS DECADES OLD. A few people on tours (Very Few) that are sensitive to the paranormal have through the years had a feeling that something paranormal lives or stirs in this area of the OLDEST HOUSE. These photos may or may not confirm MICHAEL's above statements about getting a vibe from this area. AGAIN = ABOVE & BELOW. 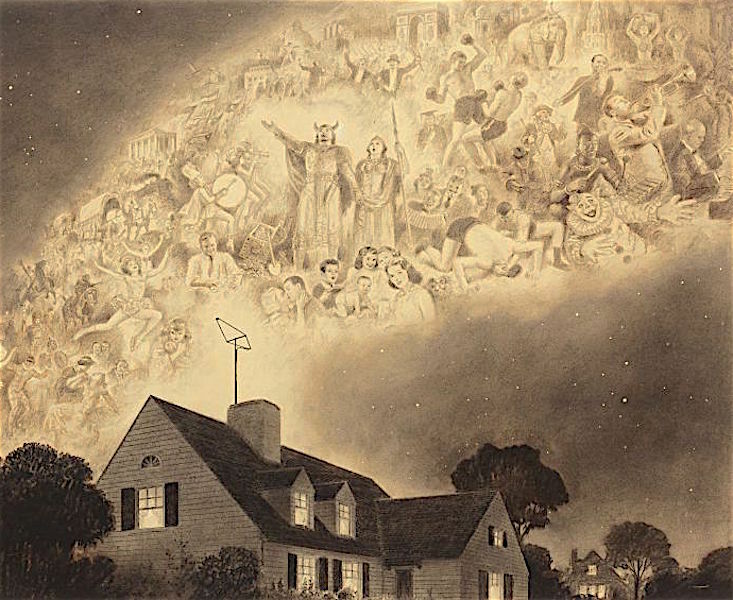 In the past what sounded like distant coughing was heard now and then inside the OLDEST HOUSE, specifically in the rooms above, that face SOUTH. 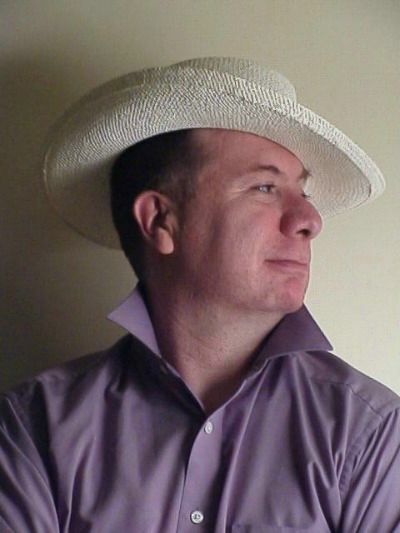 The photographer felt something up by the VIGAS and took a series of pictures. The first looks okay but only to a degree because the odd light can not be accounted for or the out of focus quality. 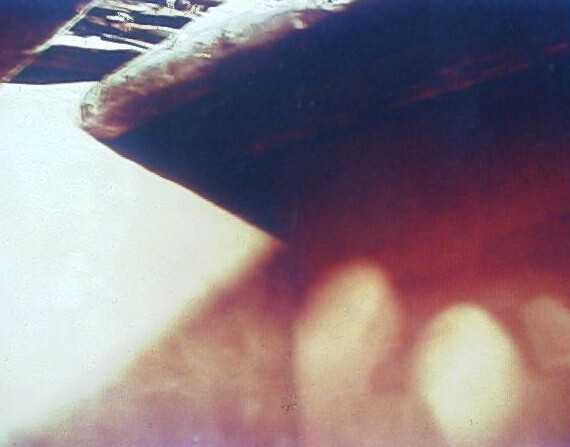 The second photo, has LIGHT REFLECTION OR ENERGY OF SOMETHING PARANORMAL? It has been pointed out to me that a demonic face can be seen to the left of the things. Hmmm? Imagination or something there? It is of interest, on different occasions cameras have malfunctioned outside and inside the building and then when away from the structure, the devices begin working perfectly. The building has been investigated by Allan many times and by psychics during the day and evening. At times this building and area is filled with things that go bump in the night. 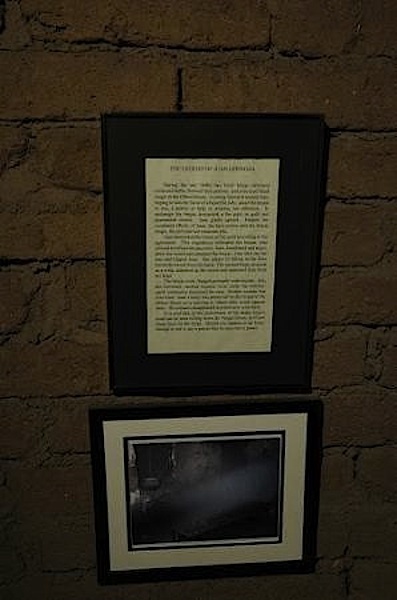 BELOW = From decades ago, a plaque and 1984 photo, documents an apparition that was felt, seen, and photographed inside the OLDEST HOUSE. This account does dovetail into what Michael saw inside this building as in a WHITE WISP of ghostly energy in one of the ghost rooms. BELOW: State of the art ghostometer (2017)--- this unit pegged out in the far ghost room of the OLDEST HOUSE… There is no electric line under this concrete slab to trigger it and there are no electric lines in the adobe walls. This area of the building has been known through the centuries to be haunted and strange things have been seen. 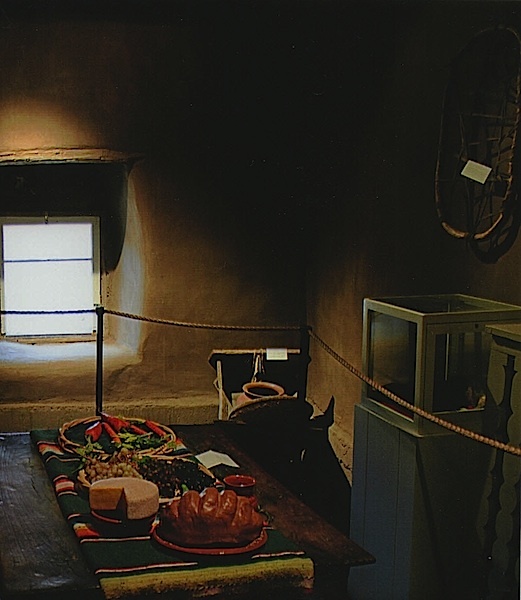 Likewise cold air has enveloped people at times, who have visited this and other rooms of the OLDEST HOUSE. Below: When it is open, Allan and his tour do visit the haunted historic building. 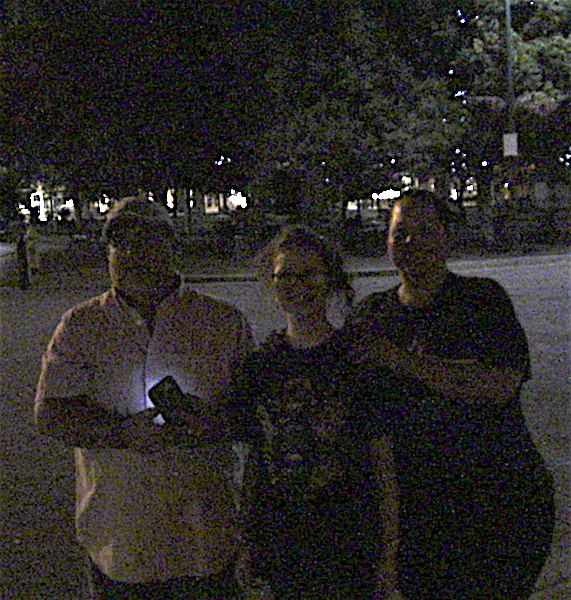 Sometimes people on tours have registered pulses of energy on their ghostometers and occasionally pictures of thaaaaangs have been taken after dark at this location. BELOW: I maintain that this photo is of light, but others say it is something else, the photo was taken as the fellow on Allan's tour was about to take a snapshot of the OLDEST HOUSE. 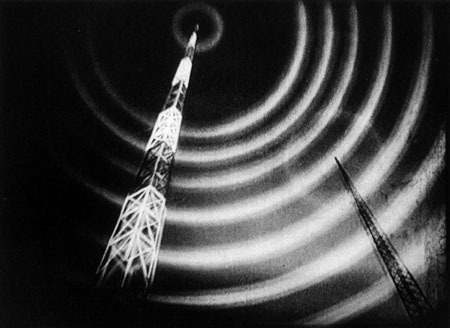 Note the twisting light or energy mixed in with the light. IT is a odd photo. As skeptical as Allan tries to be, the idea of light twisting like it does in this picture --makes one think maybe something was captured on film. 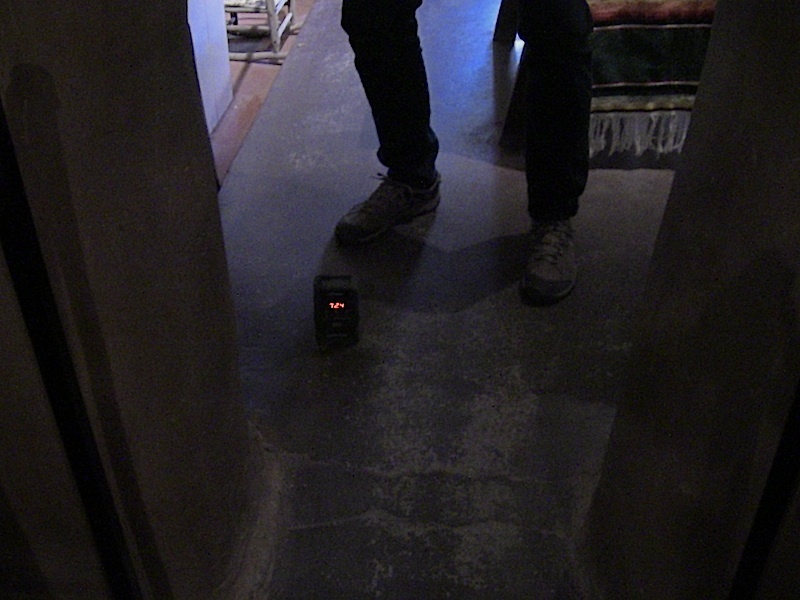 However one views this photo -- be it light or paranormal activity ---- Allan does not deviate from the idea that the OLDEST HOUSE and THE OLDEST CHURCH (behind the Belgium photographer) is haunted. 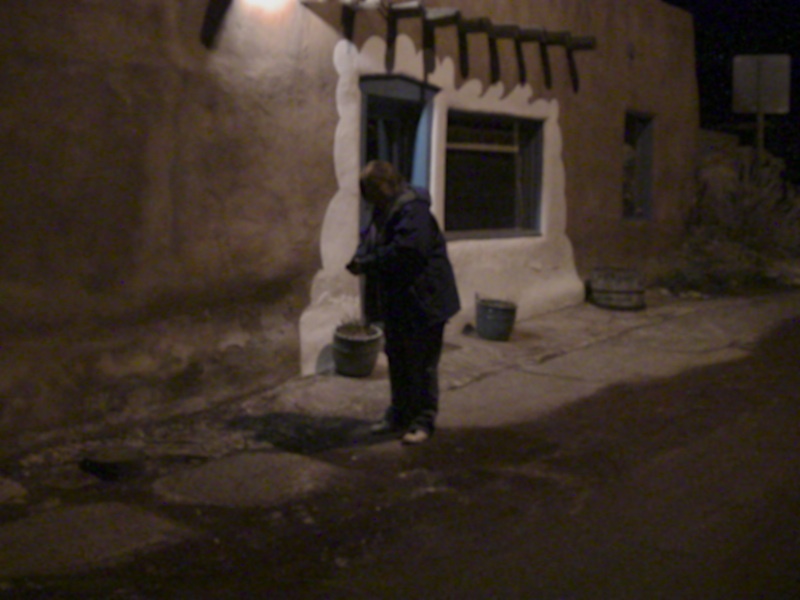 BELOW -- GHOSTS OF SANTA FE TOUR -- Inside the haunted and historic Oldest House in the USA. That is a coffin LEFT -- a relic from Wild West days. 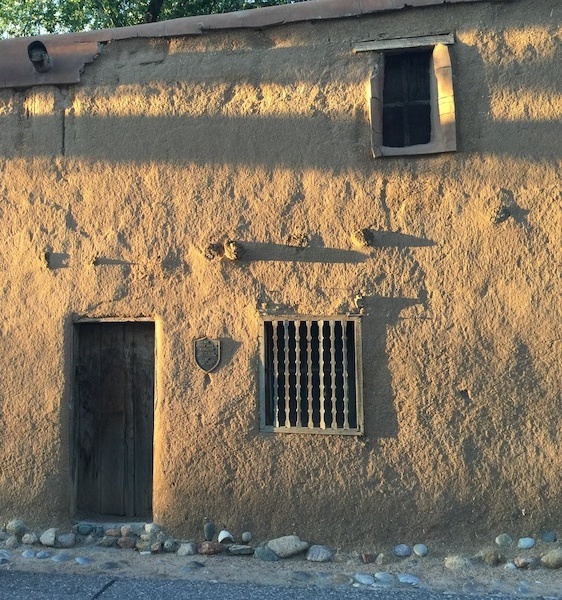 ON Allan's GHOSTS OF SANTA FE TOUR , you find out about the "LOST GRAVEYARD". It is not LOST, it is close to the OLDEST HOUSE and Allan knows where it is at. (ANOTHER REASON) Why the Oldest House is filled with ghostly energy. 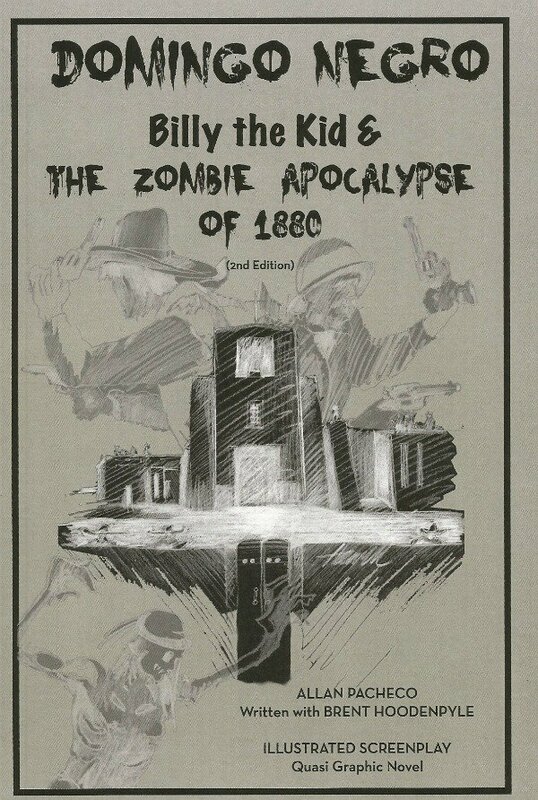 More than anything else--Allan's ghost of Santa Fe tour are fun & very interesting. 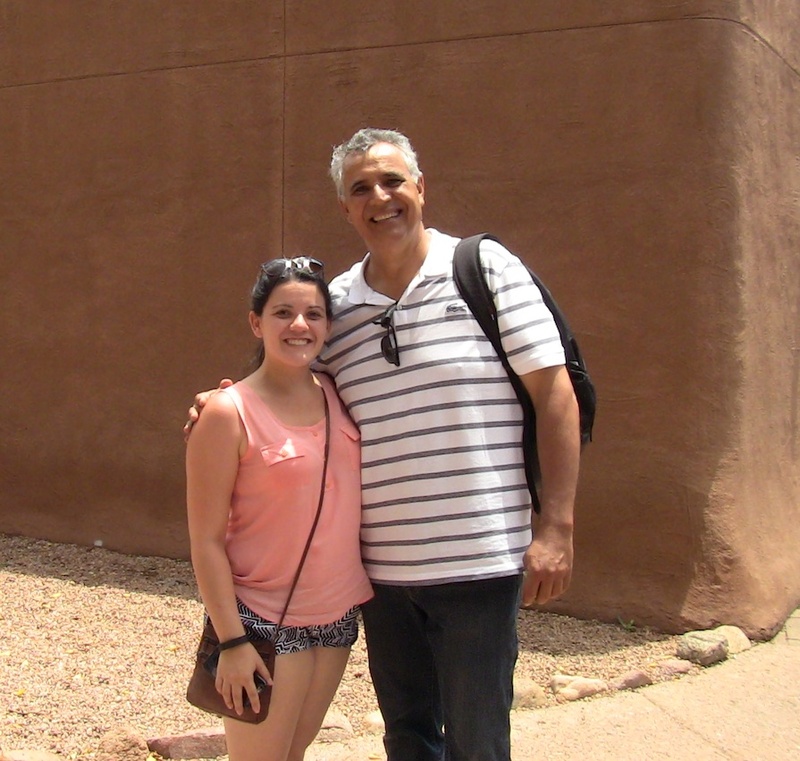 BELOW: Sergio & Liz outside the paranormal LORETTO CHAPEL. ( A good kind of paranormal at the chapel) 505-986-5002 schedule a tour. Above & Below; Ghost tours day and night in the historic Plaza -- happy groups who took Allan's "GHOSTS OF SANTA FE TOUR". 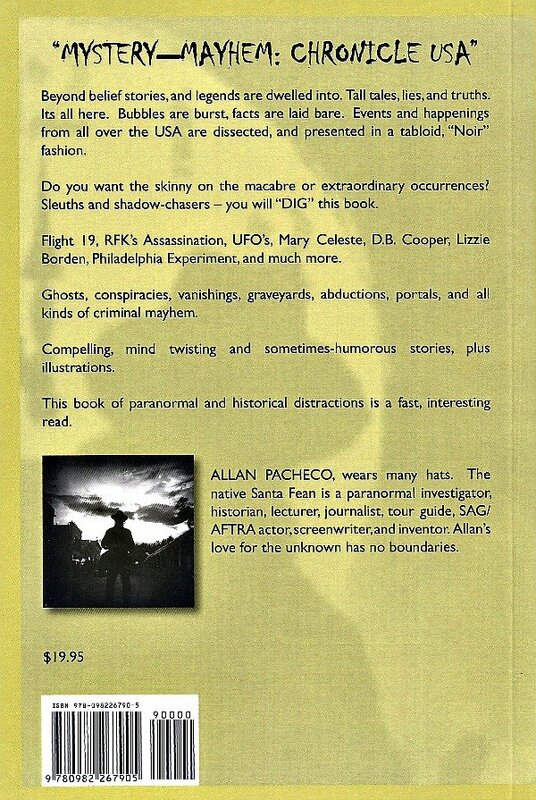 Schedule a private tour -- 505-986-5002 or go to Amazon and get one of Al Pacheco's books. 505-986-5002 or 505-231-1336 schedule a tour with ALLAN PACHECO…. = A TOUR FOR THE AGES! To order one of Allan's books click on "ORDER" button on the left menu or go to Amazon.com and purchase a book there. 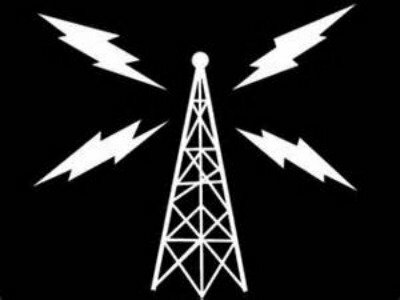 Get AL PACHECO on your radio show 505-986-5002 or 505-231-1336 santafewriter@me.com --- he is a very interesting guest -- below some of the programs he has been on. 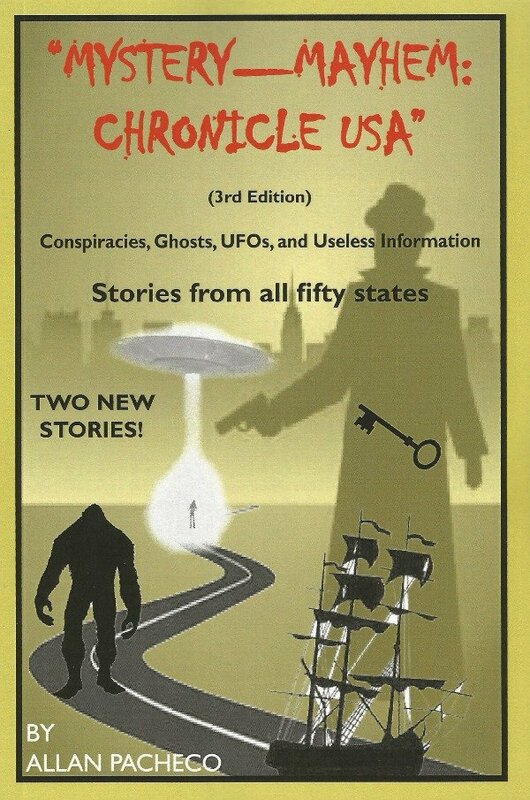 GHOSTS -- UFOS - CONSPIRACY- PARANORMAL - SANTA FE - Allan is your man. 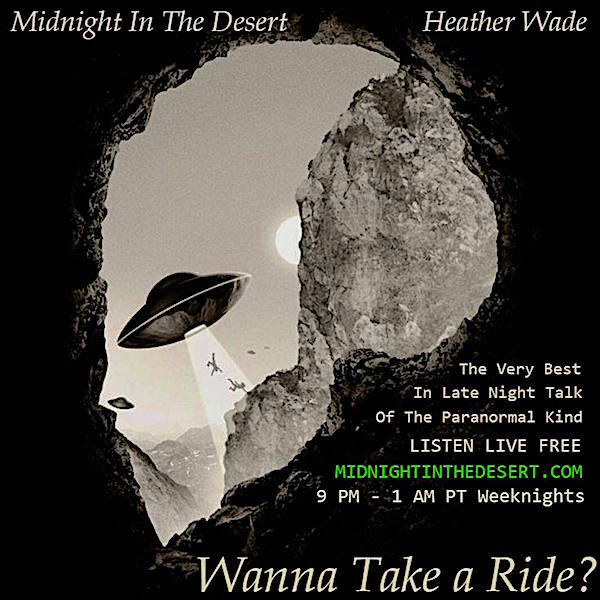 CARAVAN TO MIDNIGHT -- WAS A GHOST CAPTURED ON FILM -- AT THE END OF ALLAN's TOUR?